LED light engines are light-emitting diode versions of regular lamps. 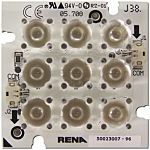 They are composed of multiple LEDs mounted on a circuit board and have numerous advantages over regular lamps, including increased efficiency and greater durability. How do LED light engines work? LEDs are different from regular light sources because they use a semiconductor to produce the energy to emit light. As LED light engines run on direct current (DC), and mains electricity is alternating current (AC), they also often contain a circuit to convert the current into the appropriate voltage. The variations between LED light engines are largely down to their colour, shape, and the number of LEDs that form the engine. This depends on the needs of your project. For example, you might need a circular LED light engine to replace a light bulb, or a strip LED light engine to replace a fluorescent strip light. Similarly, if you need brighter light, you will need an engine with more LEDs.